The Catherine wheel is a type of firework which is generally made of a spiralling tube filled with the pyrotechnic composition, or an angled rocket mounted with a pin through its centre. When ignited, it rotates quickly, producing a display of sparks and coloured flame and looks great at the bottom of the garden. So, now we know what a Catherine Wheel is, where did it get its unusual name from? The Catherine Wheel was a product of the Middle Ages, especially popular in Germany (no comments on this please, remember we’re all friends now, one Europe and all that). The victim’s limbs were brutally smashed with large blunt objects. His (or her) still-living remains were subjected to… the wheel. This meant the mangled arms and legs were threaded through the spokes. The wheel was then hoisted into the air using a long pole. Hungry vultures and crows picked at the body. Death came slowly, (like watching an Al Murray – Pub Landlord comedy routine). A seventeenth-century chronicler wrote the victim looked like, “A sort of huge screaming puppet writhing in rivulets of blood, a puppet with four tentacles, like a sea monster, of raw, slimy and shapeless flesh mixed up with splinters of smashed bones.” Sleep soundly kids. This was one of the most popular spectacles of the time. This, and similar methods of torture, took place in the squares of Europe from 1450-1750. The masses, both common people and nobles, watched in twisted fascination, cheering at a good wheeling (what made it good is unclear but we guess the messier the better). A woman (or a number of women in a row) brought even greater enthusiasm, similar to women in pro-wrestling nowadays, although for quite different reasons we assume. 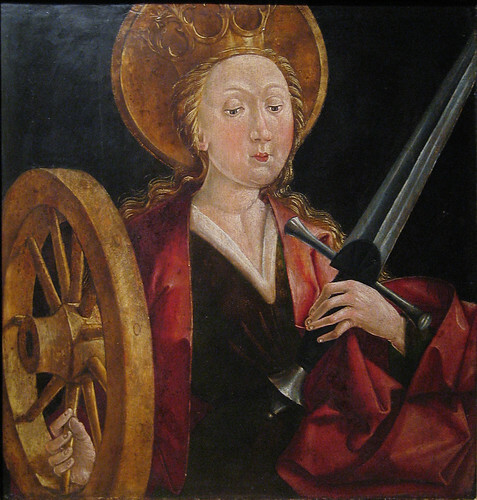 The wheel was named after Saint Catherine of Alexandria from the early 4th century. She was believed to have been killed in this fashion during the rule of the Roman Emperor Maximinus (presumably Maximinus was upset about people commenting that his name was somewhat similar to that of a sanitary towel – citation needed). Catherine was born and raised a pagan, but miraculously converted to Christianity in her late teens (typical rebellious teenager). It is said that she visited her contemporary, the Roman Emperor Maximinus, and attempted to convince him of the error of his ways in persecuting Christians. She succeeded in converting his wife, the Empress, and many pagan philosophers whom the Emperor sent to dispute with her, all of whom were subsequently martyred. Upon the failure of the Emperor to win Catherine over, he ordered her to be put in prison; and when the people who visited her converted this must have really annoyed big Maximinus because she was condemned to death on the breaking wheel (the name at that time for the Catherine Wheel). According to legend, the wheel itself broke when she touched it, so she was beheaded. Sound effects: Swish, Splat, Thud, General Medieval style cheering. Catherine was remembered thereafter as a symbol of martyrdom, purity and knackering up the wheel she was named after. 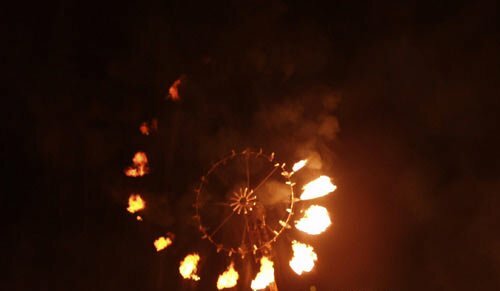 The Breaking Wheel, now known as a Catherine Wheel continued to be used for executions and all round nastiness for centuries to come and was still used right up till the 1700’s. When, thankfully, far more nasty ways of messing people up were evolved, which we will not go into here. Please remember this is supposed to be taken lightly and in good humour, no-one was tortured during the writing of this article so please don’t write in. 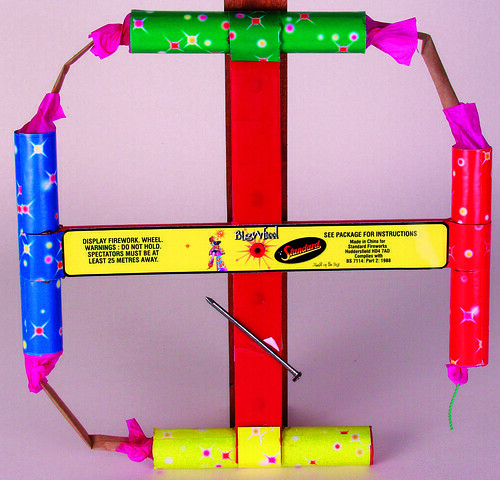 For all your Catherine Wheel needs, visit www.epicfireworks.com for the largest range of fireworks in the UK.